A perfect exmple of what can happen when a city grows quickly is the Woolloongabba fiveways. 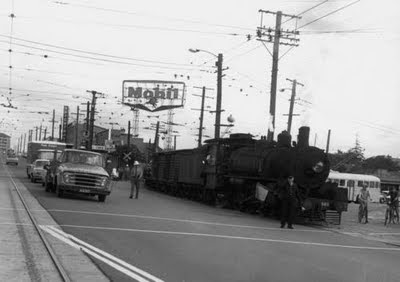 The junction of Logan Rd, Ipswich Rd, Stanley St and Main St became a traffic nightmare after the opening of the Story Bridge. As well as cars, this intersection had to cope with trams, trolley-buses and trains. That's right, trains regularly passed through the fiveways, requiring all vehicles to come to a stop so that the train could proceed. Here is a photo taken in 1969 of one of the last trains to make that journey - click on it to see a larger image. Did you notice the railway signalman clearing the way for the train? He is specially equipped with a warning bell and a red flag to warn off the driver of any other vehicle. If you have never seen a trolley-bus, there is one in the picture, right behind the train. 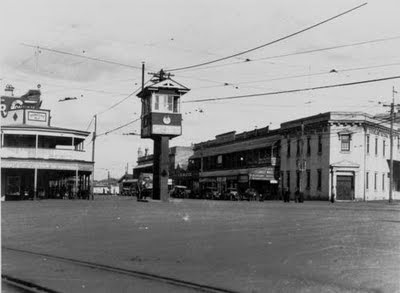 In this further image (below), you can see the signal box that contained the man who directed the trams through this intersection. The fiveways is still a busy intersection, but today it's only motor vehicles and buses, and the electrical infrastructure needed by the trams and trolley-buses has been removed. The railway signalman and the tram signal box have also gone, and traffic lights control the intersection. In my recent photo (above - click on it to see a larger version), you can see a fairly clear fiveways, with one of the controversial chimneys for the Clem7 tunnel, not yet completed, in the background. It's been specially designed to look like a jacaranda tree so that it can merge into the landscape. I think it sticks out like a sore thumb - what do you think? they got the colour right, but the shape wrong for a tree, didnt they?